Runtime: 1 hr. 43 mins. Now that Chris and his girlfriend, Rose, have reached the meet-the-parents milestone of dating, she invites him for a weekend getaway upstate with Missy and Dean. At first, Chris reads the family's overly accommodating behavior as nervous attempts to deal with their daughter's interracial relationship, but as the weekend progresses, a series of increasingly disturbing discoveries lead him to a truth that he could have never imagined. Get Out is a horror film but it's not like any horror film that has reached theaters in a long time. To begin with, it's rated R, and the R-rated horror film has become something of an endangered species in this era of PG-13'ing everything. The R, however, isn't for the usual "extreme gore" of a slasher movie. Instead, it's mainly for profanity. Get Out has only a little blood and viscera; the approach of writer/first time director Jordan Peele is to approach the more stomach-churning aspects of his production with tact. Yes, that's right - I used the word "tact" in describing a horror film. Then there's the tone. 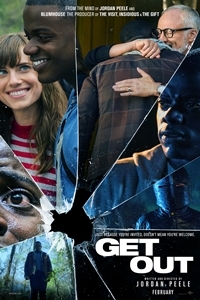 Get Out doesn't cross over the line into outright satire or comedy - it's a little too serious for that - but there are times when it comes close. Peele keeps things light while delivering the scares. There are some jump-out-of-your seat "boo!" moments, including one that's enhanced by a strident musical sting. Although dated, Scream might be the best analog. The filmmakers want us to remember that horror movies don't have to be defined by non-stop intensity and unrelenting tension. It shouldn't be a surprise that Peele would craft something like Get Out. He is, after all, known for his comedy (co-writer of Keanu on screen and Key & Peele on TV). What perhaps is unexpected is how well he strikes a balance between the scares and the guffaws. Most directors don't attempt this let alone succeed at it. Get Out also has something to say about race relations although the specifics of the message are probably in the eye of the beholder. The most obvious takeaways relate to the differences between white and black culture and the curious mix of condescension and envy that can co-exist in the minds and attitudes of some. Peele doesn't venture too deeply into this divisive minefield, however - after all, he's trying to make a crowd-pleaser and alienating a sizable portion of his audience wouldn't be a good way to start. Instead, he uses the black/white divide as a way to establish the "stranger in a strange land" milieu. Chris (Daniel Kaluuya), a black man, expects it to be uncomfortable when he accompanies his (white) girlfriend, Rose (Allison Williams), to her childhood home to meet her parents, Dean (Bradley Whitford) and Missy (Catherine Keener), and a host of their high-class friends. Although Mom and Dad seem accommodating, with Dean confiding that he would have voted for a third Obama term if possible, Chris senses that something is "off" and his fears are heightened when he notices the bizarre, zombie-like behaviors of the maid (Betty Gabriel) and the groundskeeper (Marcus Henderson), the only two other African Americans in the vicinity. Then, when Missy offers to hypnotize him to cure his smoking addiction, he wonders whether there's a connection between her talents and the strange things going on around him. As good as Get Out is, it's not without flaws. The final act is peppered with nits that are easy to pick. (I guess Chris has some hitherto unseen contortionist abilities.) The biggest twists are easier to predict and less surprising than the filmmakers want them to be. (To be fair, if you're not paying full attention - a common problem among today's ADD-afflicted audiences - they might indeed be unexpected.) None of those things spoil the fun since many of these issues are expected from any horror film worth its salt and the experience could be deemed incomplete without them. In additional to tonal similarities with Scream, Get Out also draws from other horror classics. In particular, echoes of Deliverance can be found, especially when emphasizing the main character's alienation in a foreign and potentially lethal setting. And there's more than a passing reference to The Stepford Wives in the way certain characters act and react. The praiseworthy quality of Get Out is that it delivers the goods without copycatting every cookie-cutter horror film being released today. It's the proverbial breath of fresh air blowing through a stale industry. Peele's vision is largely responsible for this, as are his unconventional casting choices. Daniel Kaluuya is the key here. The British TV veteran conveys the right mix of likability and normalcy that viewers automatically relate to him. This leads to some very strong crowd-pleasing moments late in the film. Also important to the overall tone is LilRel Howery (as Chris' best friend, TSA worker Rod), who is singlehandedly responsible for many of the film's biggest laughs. Girls' Allison Williams is appealing as the color-blind woman who is perhaps a little too trusting of her family. This early, it's impossible to say whether Get Out will outlast the upcoming 2017 contenders to emerge as the best horror film of the year but it will almost assuredly open eyes while providing theaters with the rare scary film that can be embraced as readily by those who avoid horror as those who crave it.